AFRICANGLOBE – Five young visionaries from Africa, India, Europe and the Middle East were announced at London’s leading scientific institution, the Royal Society, as winners of the 2014 Rolex Awards for Enterprise. 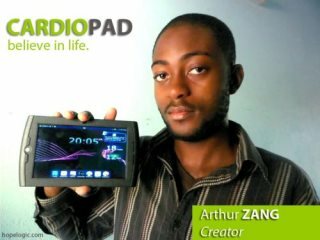 One winner in particular, Arthur Zang from Cameroon, has invented what is believed to be Africa’s first medical tablet, which will allow health-care workers in rural areas to send the results of cardiac tests to heart specialists via a mobile-phone connection. This type of technology will not only speed up the process of sending results, but may also save the lives of many people across the continent. Neeti Kailas, 29, India – aims to vastly increase screening of newborn babies for hearing loss, through an inexpensive, easy-to-use device, and to set up an associated network of health-care professionals in India who can diagnose or treat deafness. Olivier Nsengimana, 30, Rwanda – is promoting breeding programmes and the release of Rwanda’s captive, endangered grey crowned-cranes. The iconic bird, a symbol of wealth and longevity in Rwanda, is a victim of its own beauty, and is often kept as a pet. Francesco Sauro, 29, Italy – is exploring the vast quartzite caves of South America’s fabled tabletop mountains on the border of Venezuela and Brazil, making discoveries of unique worlds that have evolved in isolation over millennia. Hosam Zowawi, 29, Saudi Arabia – is developing rapid tests to detect the presence of antibiotic resistant bacteria, now considered a global threat to human health. He also plans a regional public campaign warning of the dangers of the overuse and misuse of antibiotics.